I did this canyon when Josh was with me in Colorado and since he had never done a slot canyon before I just had to take him on one. So we drove all the way out to the Roost and camped at the Motel 6 shack near Burr Pass. We didn't have a whole lot of water so we only had time for one day. A few nice guys we met also camping there gave us a little water as well which helped. The sunset that evening was brilliant as usual. I got a good sleep that night. Right as the sun rose we hurried as fast as possible to start to avoid the days heat. So we finished the drive to the start for Larry Canyon as per Kelsey's book and we parked just off the road next to the dry wash marking the very start of the Larry Canyon drainage. We packed up and started down the easy sandy wash and after only about 10 minutes we were at the first drop. This was actually the first time my 60 meter rope I had just bought will be used and I had thought it was marked at the halfway point but alas, it wasn't. I spent about 10 minutes trying to figure out how to find the center. I finally figured it out where I can put one end through the anchor ring and follow them through with both strands in hand until I hit the middle! So we harnessed up and made the first rappel down into the start of the canyon. Now that we were in it was much cooler. We didn't want to be hiking in the full sun with our jeans on. 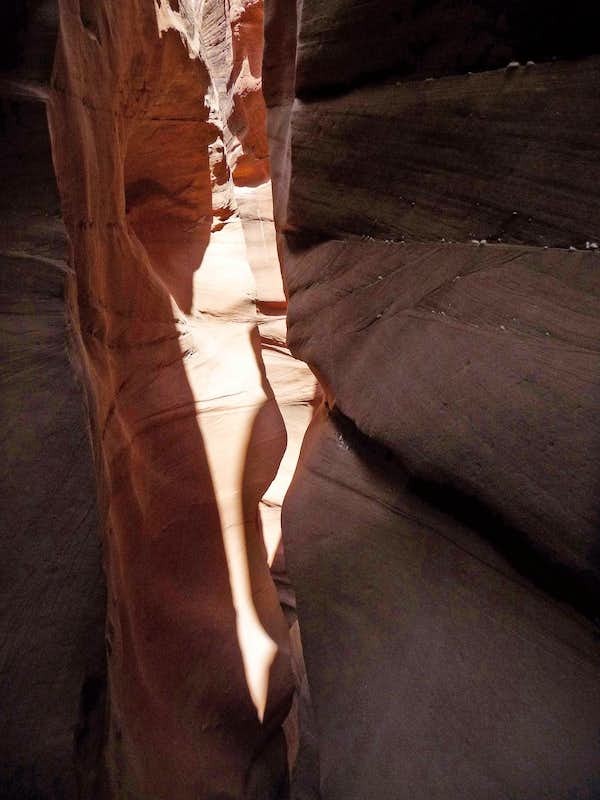 The canyon quickly got narrower and we were soon stemming and squeezing our way through a narrow slot canyon. Luckily there was no water in the canyon and we soon got to the next rappel which was a double rappel with an awkward start. We anchored into the slings wrapped around a chalkstone and rapped down. I banged up my hands pretty bad on this rappel. The next one was right after the previous rap and the anchor was another chalkstone and was in two stages. An initial drop followed by a short flat section then another drop. It was important we stayed on rappel for both sections. Beyond that the canyon opened up slightly but quickly became narrow again for a long and challenging slot with a few steep drop offs to descend, one of which did have a long blue sling to use as a handline. After this drop using the handline the canyon got very dark and slanted for a long ways. There were probably thousands of daddy long leg spiders in this area that freaked me out a little. After a half hour of working through the dark slanted section, we arrived at the next rappel where a simple rap brought us to a bench where we finally saw wide open desert. 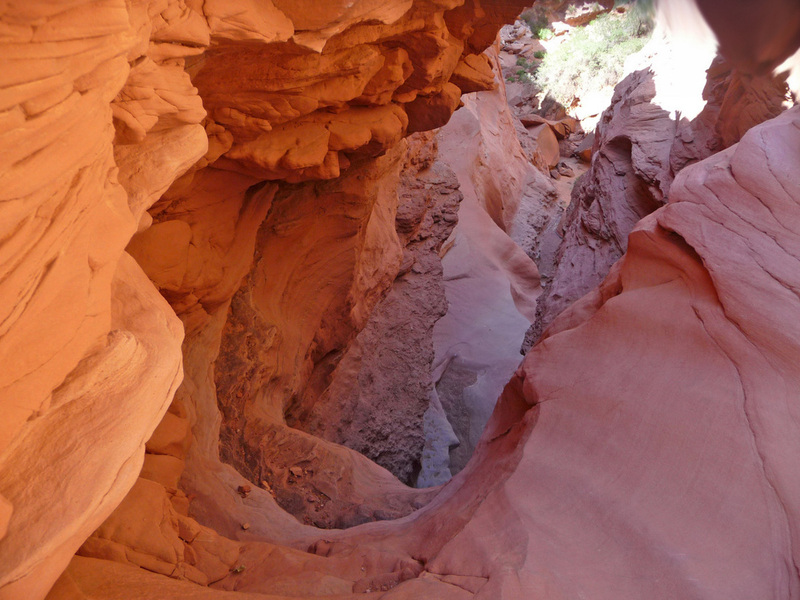 The final rappel was slightly overhanging (shown in banner above) and brought us out of the slot canyon and into a large drainage. We took a nice break here in the last bit of shade we would have before hiking down the wide open sandy gorge. 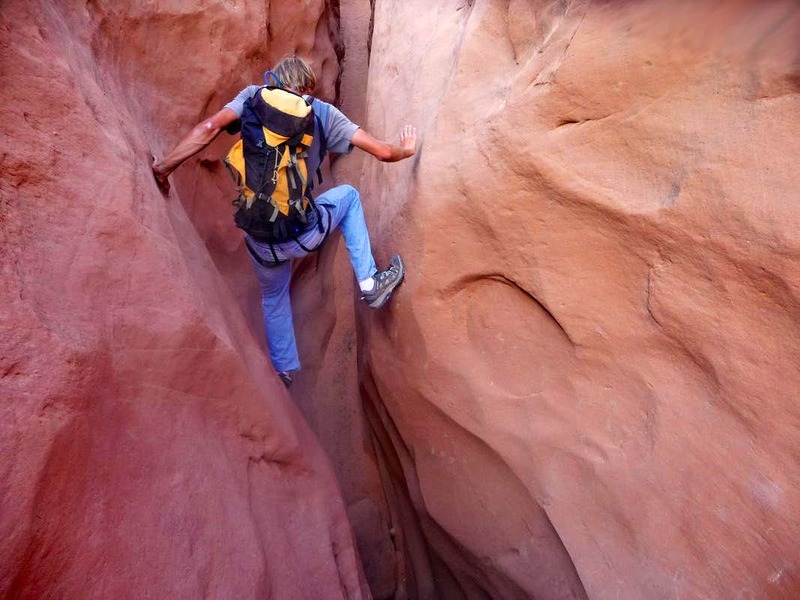 I knew what to look for (a large crack in the Navajo sandstone to the left) but didn't know exactly how far it would be. I always kept a keen eye for the escape but after an hour of walking I started to worry we had missed it. We rounded one more corner and I saw it! It was plain as day and couldn't be missed. We saw a carin marking a boot path up and out of the dry wash and through the cryptobiotic soil to the base of the crack. Climbing the crack was simple class 3 climbing. Near the top there was a nice cave to escape the suns heat (we were there in June)! Once above the crack the routefinding what somewhat confusing but we mainly friction climbed up the Navajo slabs veering slightly to the left. We were trying to reach the rim where we would follow it back towards the car. Once we got higher it became easier to see where to go and eventually we reached the rim and located the old road leading back towards the car. The hike back was very, very hot. Josh and I both ran out of water on the way back and I could tell he was really feeling dehydrated. Luckily it was flat walking or it would have been really bad. The 2 mile hike along the rim back to the car felt like it took hours. I estimated the temperature to be in the mid 90's which was the hottest Josh had ever hiked in. We finally got back to the location of the first rappel to enter the canyon and 10 minutes later were back at the car. Thank goodness it started or we would have been screwed! The drive back out the Hans Flat Road was interesting to say the least. The deep sandy area covering the road that wasn't an issue coming in (since it was downhill) was much harder going back. There was a large truck stuck in the road halfway across and was obviously abandoned. I decided to gun it and try to plow through relying on momentum but I got caught in a deep section and got stuck near the truck already there. So we got out and dug a little in the blinding wind and heat. The wind blew the sand everywhere and was in the car for ever! Once I was able to back down I gunned it again taking a slightly different path and made it across. 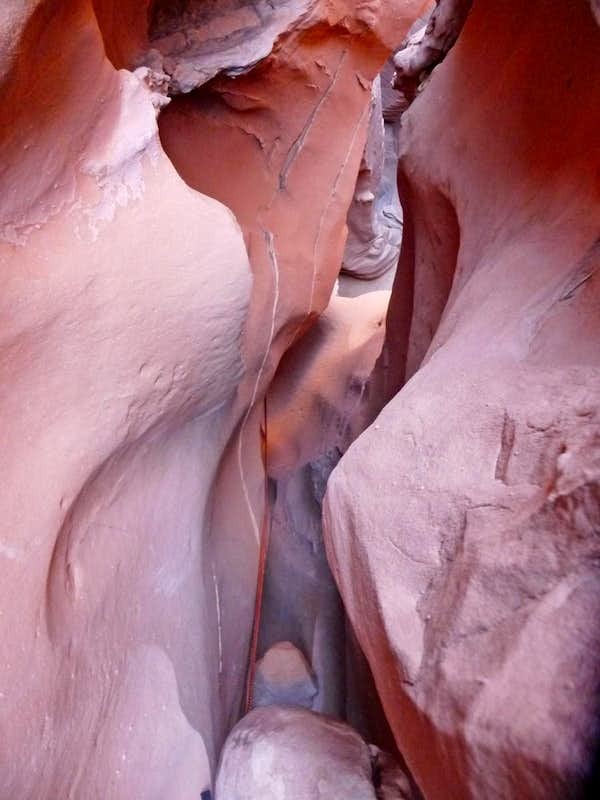 Back to Hanksville for an ice cream it was and another successful slot canyon in the books!